It's Wednesday aka Hump Day. 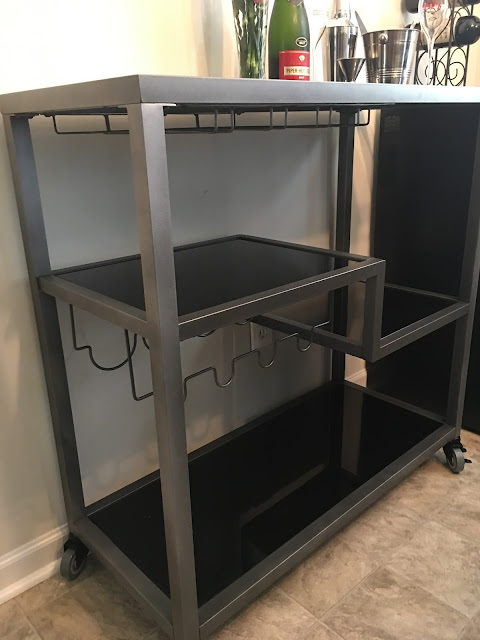 Last week I said that I was going to post a picture of the bar cart that I bought from Wayfair. I was originally going to buy a side board for the wall by the dining room table. 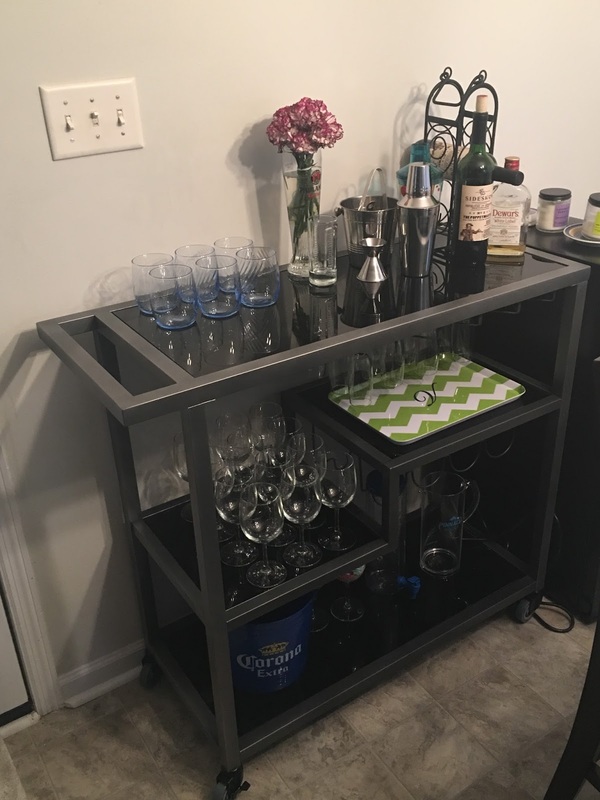 The sideboard I wanted ended up being too big so, getting a bar cart was the best option for the moment since I have no formal China or serving ware yet that needs to be stored. This is the cart before I put anything on the other shelves. The bar cart is sold out now. 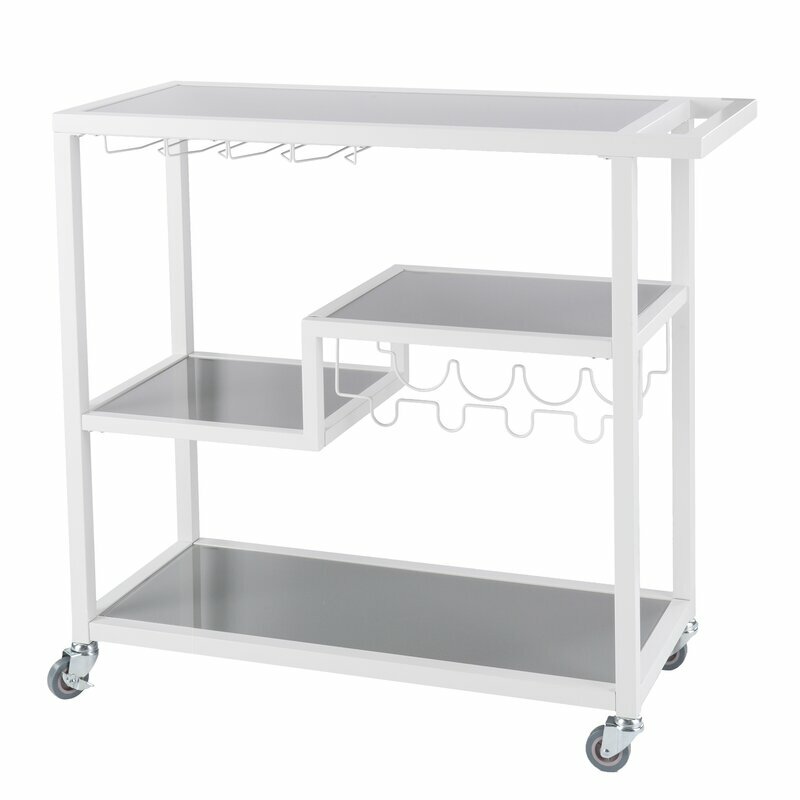 At first I wanted the white cart (pictured below) but with the white walls (for the moment until we decide to paint) it would blend together. The shelves are made of glass. Champagne flute rack is on the second level and a wine rack that holds three bottles on the bottom. By accident, I put the wine rack on backwards. Luckily, I have a small wine rack I found at World Market. Mostly, I store my wine and liquor in the wine chiller that my mom bought for me. Here is where some of the items on the cart are from: Cocktail shaker and bar accessories, Wine Rack (similar), Wine Glasses, Champagne flutes, Wine Glasses (similar), Initial Platter. I'll post the rest when it is completely done. I still have a post I need to get framed and matted for the area. just waiting for Hobby Lobby to have their frames on sale again (since I know that the frame plus the custom mat will be on the high end). Peace & blessings, all. I would love to know if anyone else has a bar cart instead of a sideboard or if you have both & why. This is my opinion of the bar cart. All opinion are mine & I did not receive any compensation for my opinion.